Need help finding the right product? Ask Dexpert! Dadex has been a pioneer in introducing state of art technology for development of u-PVC casing and screen pipes that meet all the requirements of customers for a durable pipe system. Casing and screen pipes( with male and female threads) and screen pipes (with horizontal slotting) are manufactured on advanced machinery, imported from Europe and manned by highly qualified and skilled technicians. Smooth internal surface provides excellent hydraulic characteristics. Radial slots provide greater collapse strength due to the arch effect of material around each slot. Ease of handling and installation due to its low weight, reduces the over all cost of the installation of tubewell. The joints have good tensile strength and can hold the weight of the suspended assembly. u-PVC casing pipes with male and female threaded sockets in diameters 4" & 6" (Class D), 8" & 10" (Class C & D) are available in a standard length of 4 meters. 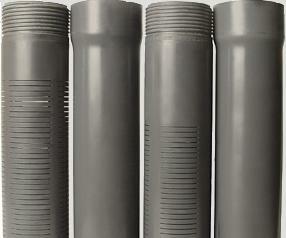 u-PVC screen pipes in diameters 4" & 6" (Class D), 8" & 10" (Class C & D) are available in a standard length of 4 meters. Our nationwide network of sales offices and technical support staff is always ready to help. If you have any queries or require more information please contact us.